Since we are somewhat limited in the number of palm species we can grow in Northern California, I am surprised that more palm lovers, and gardeners in general, don't feature a Rhapis growing somewhere in their garden. They are rather easily propagated by divisions since they grow new shoots from rhizomes that emerge from older canes and may run just under the ground surface for inches or several feet depending on how loose the soil is. 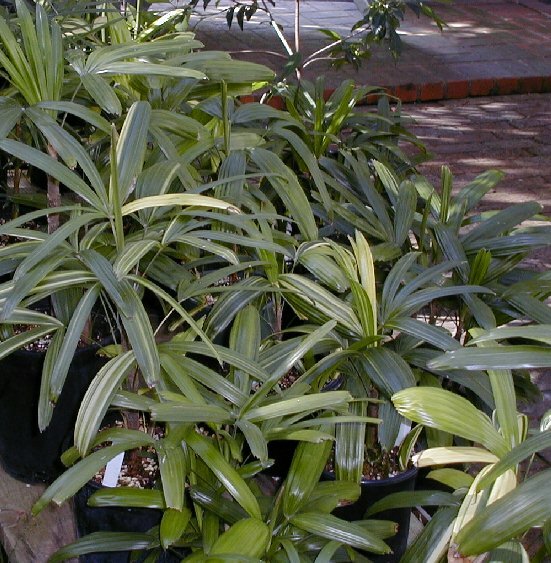 Most of the Rhapis palms found in local nurseries in northern California and often at Home Depot come from Hawaii, where they grow rather fast. You can tell their origin because they are usually growing in black lava rock, which in our dry climate, dries out rather fast. A nice plant can usually be purchased for about $50 to $100. For these Hawaiian grown plants, dividing them right away and planting them in your own favorite soil mix is usually advised as the lava rock they were grown in, dries out too fast in our sometimes hot and dry climate. For those that would like to grow a Rhapis in the ground, there are a few simple requirements. It should be a well drained area in dappled shade and in a protected area where wind is not a problem. Rhapis will grow in full shade but they prefer some sunlight, but too much exposure to hot summer sun will burn the fronds. Once established with a healthy root system, Rhapis will tolerate some drought. In fact, they like to be on the dry side from time to time. They do not like to stand in water and the roots will rot if kept to wet due to poor drainage. They need as much oxygen to the roots as possible to be healthy. Caution: A Rhapis should never be allowed to totally �dry out� as it will wilt and die quite fast. Even though Rhapis is originally from tropical and sub-tropical regions, some are cold hardy down to the low 20s, however they should be reestablished with some kind of overhead protection. If the canes should be killed by cold, they will often produce many new shoots from the mother plant. One thing for sure, they like warm weather for growth. If left outside, they stop growing for me around the middle of November and don't resume growth till late April. They grow well for me in the warmer months and I can usually expect 3 to 4 fronds per year per cane. This doesn't sound very fast, but if you multiply 3 or 4 fronds times several canes, the plant can become quite full in a couple of years. I have several Rhapis growing in the ground under the dappled shade of deciduous Oaks. They have been there for many years and have only been damaged once in the big freeze of '89/90. Some of the canes were killed at the growing point, but this only made them throw out more suckers from the damaged canes, and in a couple of years they resumed their growth. I have several varieties of Rhapis of a few different species, but most of my rarer specimens are grown in containers so that I can move them around to the most ideal lighting situation in the summer, and control the water and fertilizer schedule. Since my growing season is short, I �push� my Rhapis, giving them the maximum light without burning them. I grow them under 50% light; under lathe and the more delicate variegated specimens under 70% shade cloth. A healthy Rhapis will turn a light green color in the summer with the bright sunlight and become a dark green in the shorter months and weaker light. I use a well drained potting mix that I make myself, composed of equal parts of potting soil, Scoria (red lava rock, 1/4� size), Peralite, ground peat moss, and a few scoops of coarse builders sand, and maybe a scoop or two of chicken manure. This mixture drains fast and must be watered often in the hot summer months, but it allows oxygen to the roots in the winter when most potting soils become soggy. There is not much nutrient value in my mix, so the plants are fertilized with �Peters� 20-20-20 liquid soluble fertilizer about every two weeks. I also use fish emulsion about 3 or 4 times during the growing season. Fish emulsion has many of the required micro-nutrients and it also seems to condition the soil and retain more moisture in the warm months. (I use it on all my plants from time to time).